When Mother Nature strikes, emergency food and water is YOUR responsibility. Do you have a 3-month supply of food right now? You should. 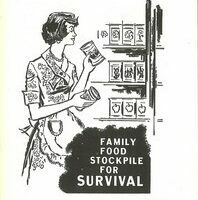 Better yet, this video shows how to start a family survival plan, with up to 1 year’s worth of food & supplies! I’m not crazy about flying on planes, so like to have two things with me every time I fly on an airplane. #1 a beverage, any beverage… even water. #2 gum. Here’s how to get your own bottle of water through the airport security checks.